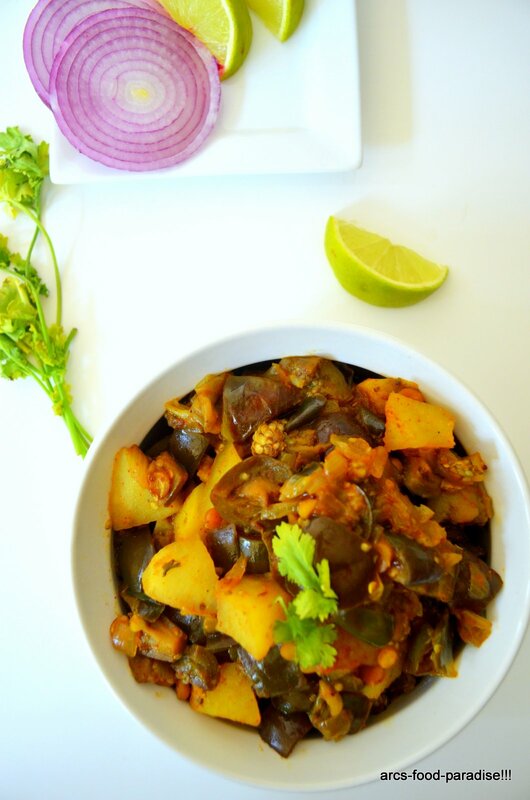 Eggplant and Potato Curry with Fresh Mint | The Flavor Nook! 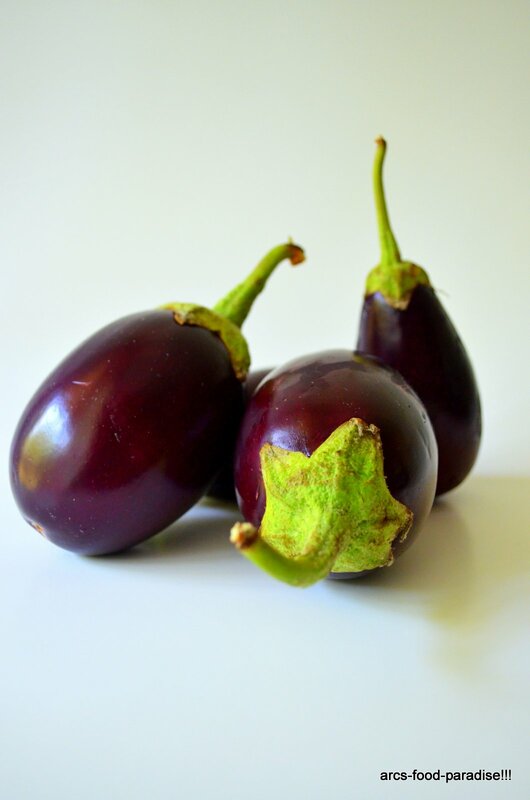 Eggplant, Brinjal, Vankaya, Baingan whatever you call it, it’s a beautiful vegetable! Don’t you think? But, this was ‘THE’ vegetable I almost would never want to eat in my childhood or rather until the last 2 years. Remember, in my ‘Mango & Strawberry Yogurt Parfait’ post I said I didn’t like yogurt too until recently? Brinjal is also on that list. In India, it is called the ‘King of Vegetables’ because of it’s nutitional content and the variety of ways it can be cooked in and ofcourse, it’s crown definitely makes it live upto it’s name! Dad always used to remind me at the dinner table about it’s title of the ‘King’ and it’s nutritional value, but nothing impressed me enough to even try it out. 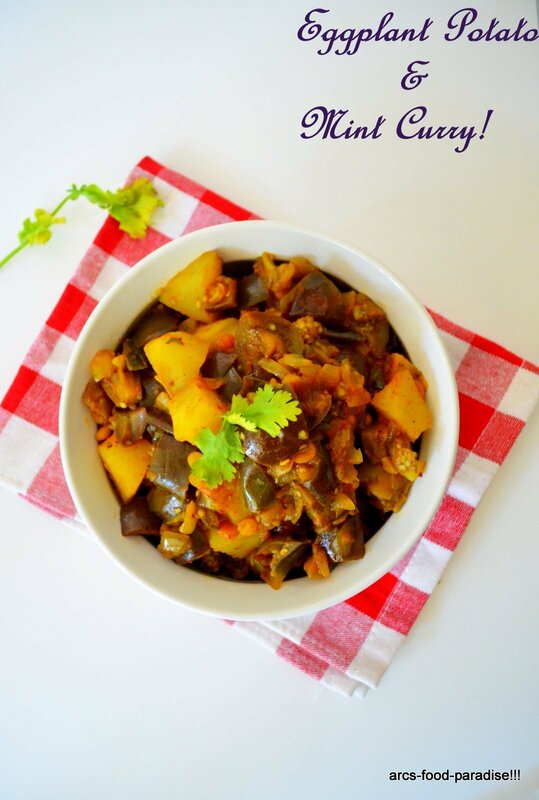 So, Mom used to add potatoes to the curry just for me and I would carefully dig the spoon into the curry to side out the heap of brinjal chunks and find my dear potatoes! 🙂 But, lately not sure what got into me, but I’m not afraid to try out things I never liked before. Infact, now eggplant is a usual occurrance on our dining table! 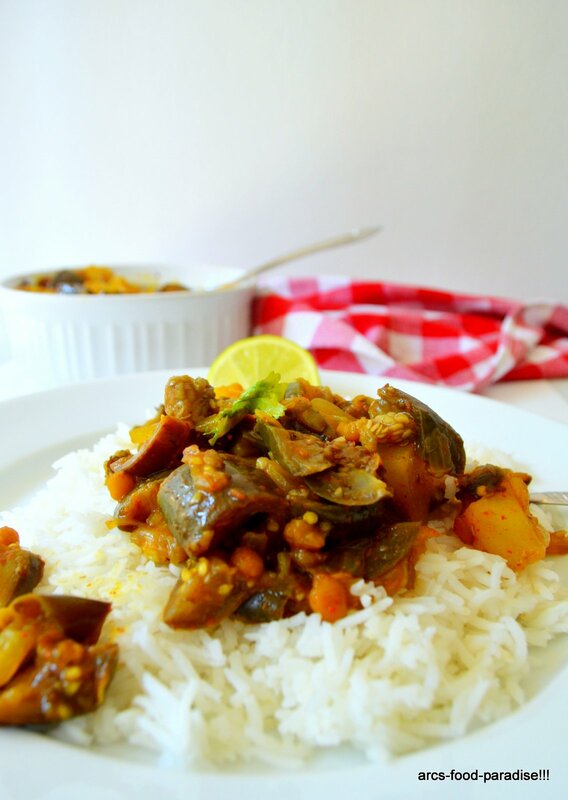 So, in this dish I used traditional Indian brinjals (the small sized ones) from a nearby Indian grocery store because I have tried the jumbo sized ones, but feel like the taste does not even come close to the traditional ones. But, of-course you could use any of your favorite varieties. I cooked the chunks of eggplant and potatoes until they are almost done and then added some finely chopped fresh mint so that the vegetables breathe in all the aromatic flavors of the mint! This is a perfect side dish that could be a part of an everyday meal or a fancy yet simple dish for a small dinner party. Serve with tortillas, rotis or rice and just enjoy the taste and the flavors of this beautiful dish. 1. Take a skillet or cooking pot and heat about 2 tsps of oil. Add mustard seeds, cumin seeds, cloves and chana dal. Saute until they sizzle for a couple of mins. Make sure the lentils/dal are lightly browned but not burned. 2. Add chopped onions and green chillies. Saute until the onions are translucent. Add ginger-garlic paste and the spices – turmeric powder, red chilli powder, garam masala and salt. Saute for a couple of minutes. 3. In the meanwhile, peel and dice the potatoes into small cubes. Take them in a bowl with water and a pinch of salt and cook them in microwave for just about 2 minutes. This should soften the potatoes a little and cook quicker when added to the skillet. If you are using baby potatoes that are not as hard, you can simply skip the microwave. 4. Just when the onions and spice mixture are almost done, start cutting the brinjals into small (but not tiny) chunks/cubes. Do not cut them well in advance, because when cut-up and open to air, they turn black due to ‘oxidation’. Well, you can definitely place them in water to avoid oxidation, but when you start to cook them, they become soggy and mushy due to all the water it has breathed in. 5. Mix the brinjals well with the spices and then cover and let cook for at-least 10 mins. Now, add the potatoes and cook for another 5 to 10 mins. When they are almost done, add finely chopped fresh mint leaves, give a quick mix and leave it on the stove for another 3 to 5 minutes. Give a taste test and adjust salt if needed. Immediately remove from stove to avoid over-cooking the brinjals. 6. Remove into a serving dish and finish off with a hint of lime juice and garnish with coriander leaves. Serve along-side rotis, tortillas or warm rice. Simple to make, tasty to eat – perfect everyday dish! – Do not over-mix the brinjals after adding them to the skillet. Do so carefully as they may become mushy! – Cooking the potatoes first in the microwave is up to you. You could also add them directly to the skillet if you wish, but the microwave step lets you control how much the potatoes are cooked through, so that you can add them to the brinjals in the end instead of them getting mashed up in the skillet. Preserving Fall leaves with Mod Podge - Bring 'Autumn' into your home!